Simon Russell Beale was educated at St Pauls Cathedral Choir School and Clifton College in Bristol. After graduating with a first in English at Cambridge University he began training as an opera singer before he turned to acting. He started his theatrical career at The Royal Court, and went on to the Royal Shakespeare Company for 8 years. Since then, he has spent 20 years at The National Theatre. 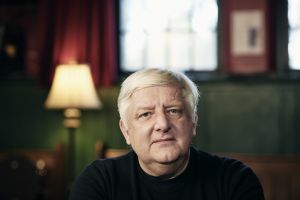 Not only has Russell Beale performed all over the world, he has also appeared in award winning TV and film. 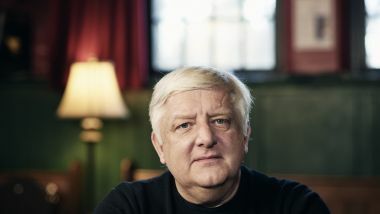 Russell Beale has presented many BBC programmes about classical music. In 2003 he was appointed a CBE in the Queen’s Birthday Honours for his services to the Arts. Theatre credits include: The Tempest, King Lear, Ghosts, Richard III, The Seagull, Edward II, Troilus & Cressida, The Man of Mode, Restoration (RSC); The Lehman Brothers, King Lear, Timon of Athens, Collaborators, London Assurance, A Slight Ache, Major Barbara, Much Ado About Nothing, The Alchemist, Life of Galileo, Jumpers, Humble Boy, Hamlet, Battle Royal, Candide, Summerfolk, Money, Othello, Rosencrantz & Guildenstern Are Dead, Volpone (National Theatre), Mr Foote’s Other Leg (Hampstead/ Haymarket); Temple, The Philanthropist, Uncle Vanya, Twelfth Night (Donmar Warehouse); The Hothouse (Trafalgar Studios); Privates On Parade (Noel Coward Theatre); Bluebird (Atlantic Theatre, New York); The Cherry Orchard, The Winter’s Tale (BAM, World Tour, Old Vic); Monty Python’s Spamalot (Palace Theatre, London & Schubert Theatre, New York); Julius Caesar (Barbican / International Tour); Macbeth (Almeida Theatre); Jumpers (Brooks Atkinson Theatre, New York); Jumpers (Piccadilly Theatre); Humble Boy (Gielgud Theatre). Ballet includes: Alice In Wonderland. Television includes: Vanity Fair, Charlie Brooker’s Weekly Wipe, Penny Dreadful, Under The Covers, Monteverdi, Legacy, Perkinson, Henry IV Parts 1 & 2, God’s Country, Symphony, Spooks, Sacred Christmas Music, American Experience, Dunkirk, The Visiters, Great Historians, Gibbon, A Dance To The Music Of Time. Film includes: Radioactive, Operation Finale, The Death of Stalin, Museo, My Cousin Rachel, Tarzan, Savannah, Into The Woods, The Deep Blue Sea, My Week With Marilyn, Hamlet. Radio includes: War & Peace, The Trials of Oscar Wilde, The Sisterhood, Waiting For Godot, Art, Radio 4 book of the Week: The Other Paris, Dead Girls Tell No Tales, Radio 4 Book of the Week: The Story of Alice, Victory, A Spy Among Friends, The Screwtape Letters, The Organist’s Daughter, Prom: National Theatre Orchestra, Twenty Minutes – Wagner, Suspicion In Ten Voices, Copenhagen, Collaborators, Olympiad / Shakespeare, In Tune, The Secret Pilgrim, Smiley’s People, Chekhov’s Gun, The Honourable Schoolboy, Tinker Tailor Soldier Spy, The Looking Glass War, The Spy Who Came In From The Cold, A Murder of Quality, Call For The Dead, Words & Music: Joy, A Shropshire Lad. Book narration includes: The Romanovs, De Profundis, A Dance to The Music of Time, Hamlet, The Tempest, Measure For Measure. Television narration includes: The National Trust. Concerts include: BBC Proms, Dancers On A Tightrope, Artaxerxes, Façade, Music & Poetry: Auden & Britten, The Firebrand Of Florence.